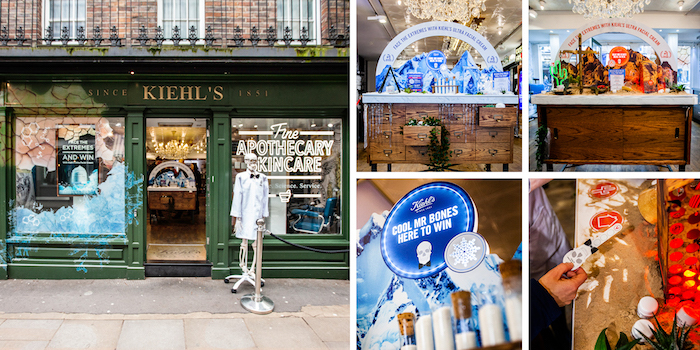 Haygarth’s campaign for Kiehl’s – the luxury beauty retailer – went live in London last weekend. Since Kiehl’s Ultra Facial Cream is great at handling the extreme conditions that skin can’t, The team used this nugget of information as inspiration to create an innovative retail experience at the Covent Garden store. The concept encouraged passers-by to engage with Mr. Bones and ‘Face the extremes and win’ by handing out innovative hot and cold reveals – activated by thermal in-store displays – to reveal their prize. This footfall-driving mechanic was supported by brand ambassadors who offered expert skin consultations in store, and a temperature-themed digital window display that brought to life freezing ice and scorching dryness conditions to create a disruptive installation. The activation was supported on Instagram, where bespoke content hosted on Kiehl’s account encouraged their wider community to get involved. The campaign heightened engagement from Kiehl’s store staff and generated increased footfall.